Hi 365ers. For the first time ever I have decided to actually take a real break over the Holiday Season. The good news is that this means you get a break from me also. I know you have been craving this day that would happen for a long long time. Instead of writing posts in advance during the holiday season and trying to find time to check in to comment I am going to cease posting from today until the 7th of January. This time of the year is meant for loving, cherishing and celebrating so my intention is to do just that, and only that. No posting, no commenting, no writing in advance for next year, no googling simplicity blogs not even any decluttering. That last one might be the biggest challenge. But considering how few gifts there are under the tree it shouldn’t be too hard. So have a wonderful festive season and I look forward to chatting with you all again in the new year. There will be a couple of changes here at 365 in the new year. I will no longer be including a decluttered item of the day in each post. I may write my post about what it is I am decluttering at the time but the excess is now dwindling so to keep up the one a day pace may prove difficult so as of now it will cease. This is good new for sure. It doesn’t mean I am done decluttering of course as there are still some things that have to be reduce, photos for instance, but they are much fewer now. I will only be posting Monday to Friday unless I have a guest post to publish or something extra pops up for Saturday. Steve is working on a whole new look for the blog. Yay! I may include some sort of monthly challenge to help fire up your decluttering efforts. And the best news is that our long time reader, commenter and occasional guest writer, Deb J has agreed to contribute a post every forth Thursday of the month. Welcome aboard Deb. I am lo0king forward to all the changes and it will be lovely to have a fresh new start in 2013. See you then. You deserve a break. It will be weird though. What will I do with my Day. Grin. Take it easy, you need a break to my friend. Hi Colleen, sounds like a great plan! I am doing the same, usually as I work as a casual (and from home part of the time) I work through the Christmas break, but by diligent saving I have put aside lost wages for the 2 week period so I will be having a proper holiday as well! And I am so looking forward to it! Enjoy your break, have a wonderful Christmas with your family and here’s to a great 2013 for all of us! You deserve a break, Happy Christmas to you all! Thanks Janetta, and a merry Christmas to you too. Relax and enjoy it! Happy Holidays & a Happy Happy New Year in 2013!!! Have enjoyed reading your blog for the past 2 years now & you have inspired me to declutter many items. Thank You so much!!! Hi Randi, it is always my pleasure to be of service. I hope you also have a very merry Christmas and a wonderful 2013. Merry Christmas Colleen, and enjoy your blog break. Thanks for all your wonderful, inspirational posts during the year. Hi Loretta, actually I am going to be down your way between the 1st and the 4th. Staying in Melbourne for a few days of my break. If you are in the city give me a call. Do you still have my number? Oh Bummer! I’ve only just read this!! Won’t be in Melbourne during that time (as we’re 3 1/2 hrs drive away now), as I’ve got my sister and her family staying with us for 4 weeks, en route to their move to France. Would have loved to see you otherwise. Hope you have/had a great time in Melbourne. Funny, deep down inside I secretly hope that my internet, phone (except emergency calls), tv, etc get turned off for x number of days just so I can not futz with that stuff & tend to other non-media / social / viewable related things & tasks. Lord knows I won’t do that on my own! Colleen, enjoy your time off & have a wonderful holiday season with you & yours from me & mine! In fact, everyone here at 365LT – have yourselves a wonderful Christmas & Merry New Declutter Year too ! Hi Jane I have a set of mini mission just for you for this coming week. Monday ~ No internet, phone (except emergency calls), and TV. Tuesday ~ No internet, phone (except emergency calls), and TV. Wednesday ~ No internet, phone (except emergency calls), and TV. Thursday ~ No internet, phone (except emergency calls), and TV. Friday ~ No internet, phone (except emergency calls), and TV. Saturday ~ No internet, phone (except emergency calls), and TV. Sunday ~ No internet, phone (except emergency calls), and TV. Follow these mission for a very merry Christmas and a relaxed start to 2013. Enjoy! Deal! I’m so game to that except…it is my fav Christmas tradition to watch certain Christmas movies on Christmas day & have to call my Mom on Christmas, otherwise, I’m up to the challenge! Have a whole lotta fun during this time! Thanks JanetW and the very same to you. Merry Christmas, Happy Chanukah! and Happy New Year everyone. Happy Holidays to you and yours! Enjoy your time, rest and relax! I hope you do the same Jen and have a very merry Christmas. Merry Christmas and a Happy New Year to you Colleen, your family and everyone here at 365lessthings! Have a wonderful holiday Colleen and be sure we will miss you during this break 🙂 . Thanks for keeping this blog and being so supportive for me and lot of others that come here. Oi Andréia, Natal feliz e um feliz ano novo a você e a sua família. Merry Christmas and a Happy New Year to you and your family Colleen! Thanks for all the support and inspiration, looking forward to making a fresh start in January. Hi Christine, I hope your Christmas is merry and that you start out fresh and raring to go in the new year. Have a lovely holiday Colleen and a wonderful Christmas! I’ve really enjoyed your posts and look forward to following them in 2013. You definitely have your priorities straight! Enjoy your holidays and I look forward to being further inspired by your blog in 2013! Enjoy your break! Definitely deserve it! So many great places in Melbourne which reminds me I had to send you the link to Joost. Have a great break! You deserve it! Cluttered holiday confessions: In regards to the holidays and incoming stuff: I found out that while my parents didn’t get me the thing I wanted the most, they found an amazing sale price on the cookware of my dreams from someone who had just bought it and didn’t want it (To the tune of buy one pot, get twenty free), so I’m getting the cookware I have wanted since moving to college! I don’t really have the cookware to get rid of in replacement, as I had been getting by on two pots and two pans for everything (which are gone as soon as I get back), waiting until I could afford this set! It’s normally a $3000 set of pots, and they paid $400 and are selling one piece of it for $200, keeping two pots, and giving me the rest! I’ve never received a present this exciting, so while it’s 13 things in and only 4 out, I’m SO excited! Part two: My boyfriend and I found a kickstarter that we LOVED (dice rings), and originally planned on getting ten rings (7 for me, 3 for him). We ended up springing for nearly 60 (29 for each of us), because the price was right on us getting a full set. HOWEVER, it counts for all four gifts this year for me, so that means I won’t get anything else for our anniversary (Jan), Valentines Day (Feb) and Birthday (Apr), AND they won’t show up until Feb, so I have some time to get rid of things and find a good spot for them. I’m so happy that we went with the full set, as ordering just the ones I *REALLY* wanted would have been about $5 less than getting all the ones I Really/kind of/sort of wanted as well. There’s actually only two out of all 60 that we don’t really care for. Big purchase right now, but we have a few months to prepare for the incoming rings, and they really aren’t that big, as I’ll be carrying 7 either on a necklace or in my purse at all times, and wearing at least one or two. May all of your presents be as amazing as mine (and hopefully even less cluttery). I did get rid of a pile of old stuff, and helped my mom with her wardrobe again, making it easier for her to build outfits this break, plus have been going through a VERY large stack of old papers, so volume wise, my presents actually cancel out what all I’ve gotten rid of. It just feels like a LOT of stuff, but overall, it could be a lot worse. I also managed to get “my” room in my parents house cleaned up again, since they filled it with THEIR clutter over the last year. Once the holidays are done, it will be back to REAL decluttering, not just the kind that holds off the influx of new stuff. Absolutely. You deserve a good break, get some good energy and bring it back to the blog. I’m excited about the new layout for the blog and I love the idea of the monthly challenge. Since I follow this blog and its contents, my life is simpler and better and it made me create my own simplicity blog in Spanish! I’ll continue to be a devoted reader in 2013. Merry Christmas and enjoy your days without blogging! You’ll surely Be missed by me as the days after Christmas during the past Couple of years have always been devoted to decluttering and organizing some daunting area. I am Looking forward to one day being so organized I won’t need that anymore but for now I guess I stick to that tradition. “See” you all Next Year! A very happy Christmas to you Cindy and all the 365 community. Enjoy your hard earned break Colleen. An how fantastic is that that you are running out of things to photo. Look forward to reading your posts DebJ. Oh and Amanda, I have absolutley no idea of kickstarter/dice rings are! This is their intro video. For someone like me (who plays DnD and board games a TON) these are an amazing idea, and they ended up with a lot more ideas than just the few they started with. Colleen, you’ve done such an amazing job with your own decluttering and in the process you’ve helped so many of us as well. Thank you. To Colleen, Cindy, Deb J and everyone else here: I wish you a peaceful, happy holiday. Hi Colleen, Wishing you and your family a very Merry Christmas and a Happy New year. Enjoy your break. I look forward to your new web site in the new year. Sounds like a great plan Colleen! Thank you for keeping me organized all year! Enjoy your holiday!! Thank you for a great year, Colleen. I have read your whole blog right from the start and I started following the blog when it was only 4-5 months old. Yours is the only blog I subscribe to via email and is one of my favourites. Well done on all your efforts, decluttering and also writing great posts every week! I look forward to another year! Colleen – enjoy the break – just like most businesses in Oz and NZ shut down over the Xmas break, you too need some down time to enjoy friends and family. Catch you back in 2013. Have a fabulous festive season and a well earned break Colleen, Cindy et al. I’m still reading the archives, which are wonderful and I have plenty of half started de-cluttering jobs to keep me busy until you return – I have finally managed to make a serious dent in the digitising photos filing and am finding that I’m not really bothered about keeping the hard copies – yay. I too find this site a massive inspiration and a great way to keep my obsession of paring down out of the way a bit – it drives OH crazy, but in here I can feel ok about it and I love hearing how others are getting on. 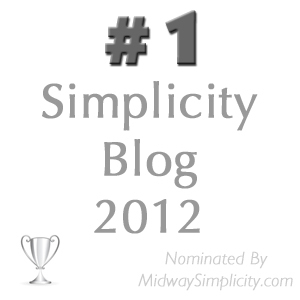 Congrats to Colleen for the title of “The Simplicity Blog of 2012” – a well earned acknowledgement from Midway Simplicity. Colleen, change is good and I can’t imagine posting an article almost every day of the year. You’re amazing. As it has only been a few months since I’ve been reading your blog, I wondered if you’ve ever considered having readers post items they’ve tossed or sold. Might add to another layer of morale boosting or encouragement for those, like me, who sometimes have trouble tossing some items. Anyway this is just a hint of an idea. I’m sure you or your readers can come up with a much better one along this line. Enjoying your blog as well as the comments posted. Great group here. One more thing…maybe some reader before and after pics would be encouraging as well. Happy holidays fellow 365ers and continued happy decluttering in 2013! Happy holidays! I am not craving any time away from you (hah!) but I am glad you are getting a much needed break. Poke me if you ever want that! 🙂 I think you have my email.